The world’s forest ecosystems provide critical and diverse services and values to human society. As primary habitat for a wide range of species, forests support biodiversity maintenance and conservation. Yet, continuing forest loss worldwide negatively impacts the livelihoods of millions of people and poses major challenges to sustainable development, in part because these forest ecosystem services continue to be undervalued, or not valued at all. Fortunately, the global community appears to be arriving at an important turning point, with a number of recent developments pointing to a positive trajectory of progress—including various commitments and agreements made in recent years such as the New York Declaration on Forests (NYDF), the Paris Agreement, the 2030 Agenda for Sustainable Development and its Sustainable Development Goals (SDGs), and the UN Strategic Plan for Forests 2017-2030 (UNSPF) and its Global Forest Goals (GFGs). Collectively, these global policy signals and growing investments provide a positive foundation for continued progress in enhancing the contribution of forest ecosystem services toward achievement of SDG 15. 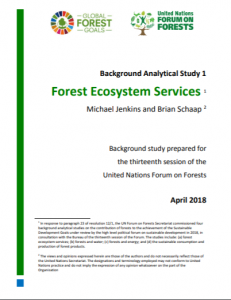 Existing international guidance documents such as the UN Forest Instrument and the UN Strategic Plan for Forests provide a framework for national actions and international cooperation to sustainably manage forests, and should continue to be promoted as tools to support countries’ efforts at integrating forest ecosystem services into all aspects of national policy-making and planning. Ultimately, countries must establish regulations and incentives which properly acknowledge and account for the values provided by forest ecosystems to society, and which direct sufficient finance to safeguard these services over the long-term for sustainable development. While evidence suggests this is beginning to happen, continued leadership and bold action will be necessary to scale-up this progress in order to fully achieve the 2030 Development Agenda goals.